I have a very smart and wonderful client, Karen*, who recently said: “I feel like you are always telling me that I’m right and everyone else is wrong Isn’t it somewhere in the middle?”. Her question gave me pause. Was I erring on the side of being too supportive and excusing her of responsibility? Had I abandoned ‘therapeutic neutrality’ in a way that was not helpful to her? I felt a tinge of anxiety as I considered these questions. Next I thought more about this young woman. Her earnest desire to live the life she wants for herself. Her ability and effort to connect with and protect others. Her constant willingness to reflect on the contributions she might make in conflicts with others. She was not someone who needed to make others feel bad or invalidated so that she could feel good or correct about herself. Third, I thought of how Karen was born to parents who required her to apologize for who she was. As a forcibly intelligent, kind, curious, charismatic and lively child she was often reprimanded for being these ways. Karen had a keen sense of right and wrong. She was not shy about speaking out against what she perceived as wrong. Unfortunately her mother seems to have fit the criteria for narcissism. This just means that one’s self-esteem is so fragile and prone to crumble that they readily blame others in relationships instead of share a sense of mutual responsibility for the way the relationship goes. Her mother felt threatened instead of proud of Karen’s sense of fairness and her big personality. She was rebuked for being a “loudmouth” or “self-centered” when she spoke up. She faced the crazy-making dilemma of either expressing herself and suffering rejection or turning against herself and feel like she belonged with them. As I’ve written elsewhere, this is never actually a choice for kid. They always adapt in order to avoid rejection from their primary caregivers. Evolution says so. I realized that Karen was right about how I was reacting to her. In the situations she discusses in therapy the only perspective being shortchanged was her own. To that end, I found myself often speaking up on her behalf as we discussed the thoughts and feelings she had related to her relationships. Although Karen had a very healthy emotional constitution, she was saddled with the belief there was something wrong with her and by extension her perspective. In her insightfulness, she correctly identified what we were doing in therapy and the problem that led her here. In this blog post, I’ll discuss how such psychologically healthy people conclude that they are the ‘damaged’ ones. Typically this happens to children of narcissists. I’ll also offer specific therapeutic principles that can empower clients’ to find their faith in themselves. Therapy clients are often way more healthy than the people in their families of origin. Consider the reasons people seek therapy: 1) alleviating psychological/emotional distress like anxiety or depression, 2) improving relationships, 3) finding more purpose or meaning in work and hobbies. Each of these reasons requires a person to admit that they are living in a state they would like to change. It may seem simple, but that admission requires a certain amount of resilience. Someone must have the internal strength to see themselves as less than perfect. In contrast, Karen’s mother would never have sought therapy to address how she was treating their daughter. They had to maintain the myth of their own self-righteousness. They may also have been too terrified of being exposed as imperfect. Such people do not seek truth but rather lies that afford them the most convenient life possible. This client’s mother could not examine her own self-absorption so she laid it at my client’s doorstep. She was also not willing to consider how she felt outdone by my client’s precociousness as a child. Instead she leveraged her power as a parent to convince my client that her gifts were “bad” or “selfish”. In these ways my client’s mother attained convenience without concern for the truth. When parents blame a child for their own feelings, the child concludes that he is responsible for their emotions. Parents inherently have more power than children. A child needs a parent for survival more than the parent needs the child. Most parents have enough psychological health and empathy not to exploit this power. Others are not so restrained. These parents consciously and unconsciously see their child as an opportunity to offload whatever bothersome feelings they experience. Felt disrespected today at work? Yell at your son for not taking out the trash when you asked him to. Feel pressed to meet coworkers and parents needs but never your own And so on. Most importantly, such parents show and feel no remorse for how they treat their children. In their minds their children (i.e. victims) are getting what they deserve. Adult children of narcissists often have a level of inner fortitude that allows them to find the therapy office instead of unquestioningly paying these attitudes and misdeeds forward to their own kids, partners, and friends. As kids they endured assault after assault on their inner goodness and had nobody to tell how much it hurt. To borrow another client’s metaphor, they navigate their childhoods like Muhammad Ali tired out George Foreman in the Rumble in the Jungle. Ali leaned against the ropes and let Foreman punch himself to the point of exhaustion before Ali knocked him out. It’s known as the ‘rope-a-dope‘ strategy. The difference is that kids can’t land that knockout blow to a parent. They’re in the excruciating position of needing that parent for their own survival. They can only try to minimize the impact of the hits they take without truly punching back. “injurious childhood experiences in and of themselves need not be traumatic (or at least not lastingly so)… Pain is not pathology. It is the absence of adequate attunement to the child’s painful emotional reactions that renders them unendurable and thus a source of traumatic states and psychopathology” (Stolorow, 2008). This means that getting mistreated by a parent isn’t by itself going to result in psychological problems. It’s the absence of someone to tell that is most damaging. In the vacuum of nobody to speak to, insidious distortions creep in. What happens in therapy with adult children of narcissists? So, the clients who fit this profile have endured legacies of being chronically and gravely mistreated and reluctantly convinced that it was their own fault. Such clients may present in therapy with complaints of not knowing themselves, having communication problems, or being too concerned with what others think. As therapy unfolds, the target quickly emerges: to disconfirm the client’s belief that his abuse was deserved and to provide the experience of being believed in how wrongly he was treated. The client is now able to tell someone. Such clients have spent their lifetimes complying with their parents’ message that they do not deserve to be listened to, respected, nor protected. In my own experience as a therapist and a client, merely showing empathy, positive regard and a desire to understand is necessary but not sufficient. In the case of Karen, I have tried to adopt an attitude towards her that reflects how she actually is – not how she sees herself. I would often purposely disagree with how she saw herself. Such targeted disagreement required an understanding of her goals in therapy (to like and know herself more), the faulty beliefs standing in her way (that she’s selfish and rude), and the early relational experiences that led to these beliefs (her mother’s criticism and self-absorption). These three ways of understanding a client reflect a Control Mastery Theory case conceptualization. This client shows up in the world as a genuine, thoughtful, caring, intelligent person. It was easy to respond to her in kind. She received my attitude towards her and disagreement with her in the ways I am about to describe fairly well. I would offer that she did so because such feedback helped her disconfirm the faulty belief that she’s selfish and rude. Here is one example of productive disagreement. Karen would often conclude that people do not genuinely enjoy her company. I react with sincere astonishment at these claims and gently wonder with her how she could possibly come to this conclusion. In doing so, I am trying to convey that I want to understand her inner experience and that I am in violent disagreement with it. Tactically disagreeing with such clients can be very important because it speaks to the version of themselves that they know – at a deep level – is the most true. Furthermore, the message is sent that it is safe to experience herself as likeable in this new relationship. 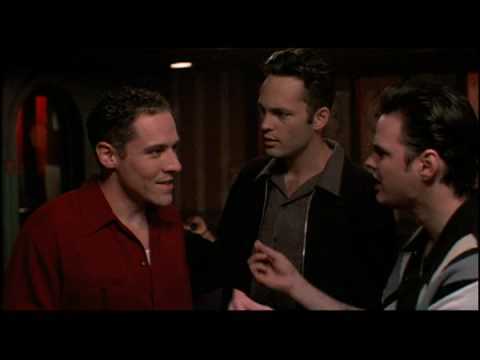 Vince Vaughn is responding to how Jon Favreau would actually be received in the world – “like a big bear with fangs” – in contrast to Favreau’s false belief that he has nothing to offer. In order to survive this kind of abuse, client’s often had to devise schemes of what they could do to make mom or dad finally love them in the way they needed. The child does not take the parent’s abusive behavior at face value but rather as an obstacle to overcome. Such kids can develop the hope that if they overcome their parent’s abusiveness then they will be loved. This hope can sustain a child through tremendous amounts of pain. It comes with a cost though – having to live a pretty terrible inner life. Thus, in order to achieve a better quality of life as adults, clients must relinquish the hope that they could have pleased their abusers. For the types of clients I am describing, they most often enact #2 and #3. Clients can act like their abuser is still around and in control by choosing friends and partners with similar traits to their abusers. In the case of Karen, she would often choose friends and partners who were self-absorbed and dismissive towards Karen’s assertion of her own needs. By populating their lives with people who act like their abusers, such clients persist the hope that they could have ‘unlocked’ the approval that their abuser withheld from them. Other clients may readily say that have forgiven their parents or that “they did the best they could” or that they want to “leave what’s in the past where it belongs”. Such attitudes often serve to protect themselves from knowing the full extent of how they were mistreated. I will empathically confront my clients when I think they may be populating their lives with abusive people or excusing the behavior of their past abusers. In the case of Karen, it was easy to support her perspective in matters because she found herself in conflict with people who tended to be self-absorbed. In other cases, I will gently ask what it would mean to a client if they were not forgiving towards their abusers? This will often lead to the kinds of self-criticism that mimics their abusers’ attitudes towards them. Clients may say “that would mean I can’t let go”, “that I’m too sensitive”, “that I am taking pleasure out of making them suffer”. Although clients may experience an uptick in anxiety at such confrontations, it often allows them to challenge and reduce their protectiveness towards their abusers. As we work through such clients’ ambivalence towards their abusers, there are often moments when choosing not to accept a past or current abuser’s presence feels like it’s going too far. I have yet to work with anyone in this type of predicament where they actually erred by being too assertive. In therapy, I often encourage them to “double-down” on their inclinations to separate from such people. By doubling-down on this self-protective instinct they make a leap of faith that is helpful. They act on their own instincts instead of how they think the other might perceive them. They also practice trusting themselves rather than what they are told. Clients will often treat themselves as their abuser treated them. This is self-evident in Karen’s case. Her consistent doubt of her own perspective mimicked how her mother so often invalidated her. The kind of disagreement described above directly challenges this wish for reconciliation with their abuser. Many clients who seek therapy have transcending the abusive contexts they emerged from. The goal of therapy is to free them to fully realize how they have been the healthy ones all along. To this end, tactical disagreement with client’s claims of their supposed ‘pathology’ is called for. It can also be helpful to challenge a client’s wish to protect their abusers. Jay Reid is a Licensed Professional Clinical Counselor (LPCC). If you are considering therapy for overcoming a childhood with one or more narcissistic parents please contact me for a free 15-minute phone consultation. Alan Rappaport, Ph.D. has written extensively on the treatment of adult children of narcissists. This paper was particularly influential in writing this blog. I highly recommend it. Benjamin, L. S. (2003) Interpersonal Reconstructive Therapy (IRT): an integrative personality-based treatment for complex cases. New York: Guilford Press. This is the most accurate decription I have ever read of the inner landscape of the adult child of narcissists. Thank you. Your words are exceptionally validating for the adult child. I really appreciate your feedback. It’s very reinforcing to know that going through narcissistic abuse can be a shared experience. I’ve found that antidotal to the isolation and attempts to make crazy that this form of abuse can often take. This article worth gold. Thank you, right time, right words. Thank you very much. I am glad you found it useful.